3 John: A Tale of Three Men - Ray Stedman - "The Bible without the Spirit leads to a dead, institutional Christianity. The Spirit without the Bible leads to groundless fanaticism. We need both the Spirit and the Word to effectively Adventure through the Bible." McClintock and Strong's Bible Encyclopedia John, Second and Third Epistles Of. Sidlow Baxter - 3 John - TRUTH AND LOVE VERSUS PRIDE AND STRIFE. HOSPITALITY - A FAITHFUL WORK" (verse 5, R.V.). GAIUS - SERVICE IN-TRUTH AND LOVE (3Jn 1:2-8)."Brethren... witness to thy truth" (3Jn 1:3, R.V.)."Brethren... witness to thy love" (verse 6, R.V.). DIOTREPHES - EVIL BY PRIDE AND STRIFE (3Jn 1:9-11). "Who loveth to have the pre-eminence" (3Jn 1:9). "And casteth them out of the church" (3Jn 1:10).Commendation of one, Demetrius - (3 Jn 1:12). Parting words - 3 Jn 1:13,14. This third epistle of John is addressed to "Gaius." As this name was just about as common in the Roman world as the name John Smith is in the British Isles today, it would be rather rash without any further data to infer that the Gaius whom John here addresses is the same as others of that name who are mentioned elsewhere in the New Testament (Ac 19:29,20:4; Ro 16:23; 1 Co 1:14). Let all who open their homes and give hospitality to our Lord's ministering servants see from this letter to the hospitable Gaius how the Lord Himself regards their kindliness. They are "fellow-helpers of the truth" (verse 8). The providing of such hospitality can sometimes be very tiring. Had Gaius been generously overdoing it? Had he overtaxed himself, giving cause for John's solicitous concern as to his health (verse 2)? Alas, over against the unselfish Gaius was the selfish Diotrephes, who cuts a sorry contrast. His is tongue and temper are deplored in verse 10. Dr. Campbell Morgan well says: "The whole truth about this man is seen in one of those illuminative sentences in which the character of a man is so often revealed in the Scriptures. 'Diotrephes, who loveth to have the pre-eminence.' That is the essential violation of love, for 'love... seeketh not her own.' This is an instance of heterodoxy of spirit or temper, rather than of intellect. There is no evidence that this man was teaching false doctrine, but he was not submissive to authority. As is always the case, the unsubmissive one becomes the greatest tyrant, and thus by disobedience he manifests his lack of love." Glance, again at verse 7: "They went forth for the sake of THE NAME." It is arresting. To Christian hearts it is thrilling. Just as "the Name" to a Jew always meant Jehovah, so now to the Christian-whether Jew or Gentile - "the Name" means the One which is dear and glorious above all others. Ignatius, later writing to the Ephesians, says: "I am in bonds for the Name's sake"; and, "Some are wont of malicious guile to hawk about the Name." In Ac 5:41 the whipped apostles left the council chambers, not chafed and humiliated, but "rejoicing that they were counted worthy to suffer dishonour for THE NAME"! Oh, for a like humility, loyalty and love! Who didst so much for me! Third John was written to John’s generous and warmhearted friend Gaius. This man was the model of a true Christian layman who had dedicated his wealth and talents to the Lord. His purse strings were loose and his latchstring was out. All he had belonged to Christ. He was the picture of the man who had found Christ to be “the Way,” and in his everyday life, he tried to show that gracious Way to others. Such people, scattered here and there, have through the years kept not only the Church alive in an unfriendly world, but also Christ’s love burning brightly for God’s people when all around seemed dark. Gaius was noted for his hospitality, a manifestation of Christian love. John urges him to continue entertaining the traveling preachers in spite of the bitter opposition of an autocratic and blustering church official named Diotrephes. You can be either a Gaius, helping in the Kingdom, or a Diotrephes, hindering the cause. What a splendid thing to be rich and powerful and to choose to lay all of your gifts and talents at Jesus’ feet, like Gaius and Demetrius! Introduction by John MacArthur - Excerpt (Click for full introduction) - Third John is perhaps the most personal of John’s 3 epistles. While 1 John appears to be a general letter addressed to congregations scattered throughout Asia Minor, and 2 John was sent to a lady and her family (2 John 1), in 3 John the apostle clearly names the sole recipient as “the beloved Gaius” (3 John 1:1). This makes the epistle one of a few letters in the NT addressed strictly to an individual (cf. Philemon). The name “Gaius” was very common in the first century (e.g., Acts 19:29; 20:4; Rom. 16:23; 1 Cor. 1:14), but nothing is known of this individual beyond John’s salutation, from which it is inferred that he was a member of one of the churches under John’s spiritual oversight. As with 2 John, 3 John focuses on the basic issue of hospitality but from a different perspective. While 2 John warns against showing hospitality to false teachers (2 John 7–11), 3 John condemns the lack of hospitality shown to faithful ministers of the Word (vv. 9,10). Reports came back to the apostle that itinerant teachers known and approved by him (3 John 1:5–8) had traveled to a certain congregation where they were refused hospitality (e.g., lodging and provision) by an individual named Diotrephes who domineered the assembly (3 John 1:10). Diotrephes went even further, for he also verbally slandered the Apostle John with malicious accusations and excluded anyone from the assembly who dared challenge him (3 John 1:10). In contrast, Gaius, a beloved friend of the apostle and faithful adherent to the truth (3 John 1:1–4), extended the correct standard of Christian hospitality to itinerant ministers. John wrote to commend the type of hospitality exhibited by Gaius to worthy representatives of the gospel (3 John 1:6–8) and to condemn the high-handed actions of Diotrephes (3 John 1:10). The apostle promised to correct the situation personally and sent this letter through an individual named Demetrius, whom he commended for his good testimony among the brethren (3 John 1:10–12). John Cereghin - (Comments on 1 John but important to help understand Brooke's perspective) He thinks in I John, Christ is "separated from us by sinlessness rather than by Divinity" (xvi); will not suggest who the author is (xviii); discusses the meaning of “propitiation” (23-27); argues from the meaning of the Greek tense; refers to the antichrist legend (59,69-79); holds that John clearly identified Jesus the man who lived a human life with the Son of God (121-122); has extended comments on the text of the “heavenly witnesses” (154-165). (He paraphrases Cyril Barber's comment in which Barber says Brooke) Deprecates the deity of Christ, rejects as "legend" the teaching regarding the Antichrist and minimizes the efficacy of Christ's death on the cross. Exegetically valuable; theological unreliable. More modern commentary. Conservative. Brief comments. Annual $50 fee or $5 monthly [click] required to view the entire article but will give you access to literally thousands of conservative articles (recommended). Anything written by D Edmond Hiebert is worth your time in consulting! Recommended Resource - The two sermons together are about 34 pages of material. This is another sample of the Apostle John's private correspondence. This letter was written to a generous and warm-hearted friend called Gaius, noted for loving hospitality, urging him to continue entertaining the traveling preachers, in spite of the bitter opposition of an autocratic and blustering Church official called Diotrephes. 1. Was Gaius ill? (2). 2. Was Gaius one of Paul's converts? Note: "My children" (4). 3. Did Paul love Gaius very ardently? The word "Beloved" is repeated in this short letter, indicating ardent affection (1, 2, 5, 11). 4. Was Gaius prospering spiritually in the things of God? (2). As in his previous writings, John has much to say about Truth. Note the various aspects of Truth. I. An Indwelling. Truth is first regarded as being in the man. "The truth that is in you" (3). II. A Road. Truth is then viewed as a road on which, and within whose limits, the man walks. "Even as you walk in the truth" (3). III. An Atmosphere. Truth is now considered as an atmosphere in which the man moves. "Walk in truth" (4). IV. A Soil, in which love is rooted (1). "I love in the truth." V. A Weapon (8). 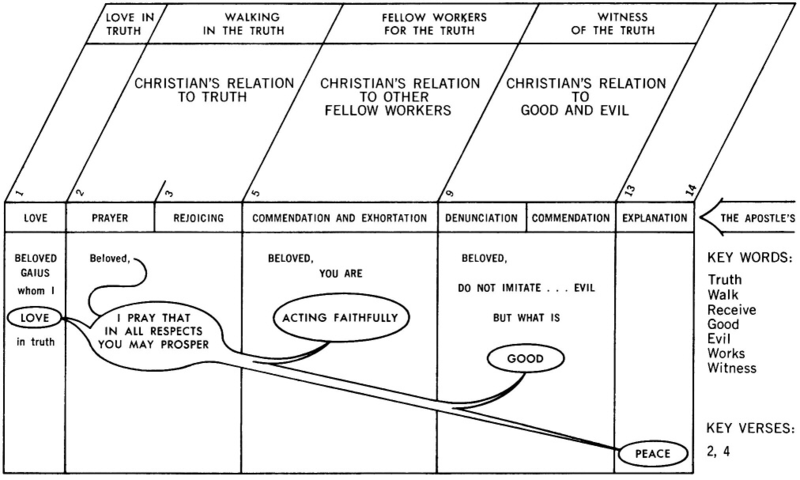 "Fellow-workers with truth" (R.V.). Suggesting truth as their powerful weapon in Christian Service. VI. A Companion. "Fellow-helpers to the truth" (8), suggesting that in our pilgrimage we should make truth our companion. VII. Referee. Giving testimony in favor of these who walk in truth. "Demetrius has good report of all men, and of the truth itself." IT'S one of the few places on earth where the air is as fresh and clean as it must have been millennia ago. Constant winds keep out pollution and germs, and the climate discourages the growth of native viruses. It sounds like the healthiest place on earth. So why doesn't anyone want to live there? Because it's also the coldest place on earth. With temperatures that drop to minus 100 degrees Fahr­enheit, the South Pole is too frigid even for germs. Some churches bear a striking resemblance to that sterile atmosphere. The truth of God is preached, Scriptures are metic­ulously quoted, and error has no chance to survive. But neither does life. The spiritual temperature is subzero, as evidenced by the cold shoulder given to the poor and needy (James 2:2-6). Those weak in the faith engage in icy arguments (Romans 14:1). Those who threaten to invade their comfortable cliques are left out in the cold (3 John 5-10). Unloved and unwelcomed, many people leave. Be a voice of encouragement to someone today. Thank You, Lord, for the people who have encouraged me to keep walking in Your truth. May I honor them by helping someone along that road today. It's one of the few places on earth where the air is as fresh and clean as it must have been millennia ago. Constant winds keep out pollution and germs, and the climate discourages the growth of native viruses. It sounds like the healthiest place on earth. So why doesn't anyone want to live there? Because it's just too cold. With temperatures that drop to -100¡ Fahrenheit, the South Pole is too frigid even for germs. Some churches bear a striking resemblance to that sterile atmosphere. The truth of God is preached, Scriptures are meticulously quoted, and error has no chance to survive. But there is no corresponding obedience or love, and the spiritual temperature is sub-zero. The poor are given the cold shoulder (James 2:2-6). Those weak in the faith engage in icy arguments (Rom. 14:1). Brothers in Christ are left out in the cold because they pose a threat to comfortable cliques (3 John 5-10). Unloved and untouched, many people leave. The church should always be a warm shelter in a cold world. When it's my turn to pack school lunches, I write my kids' names on the bags. But on two of the lunches, I've been instructed to write "Pistol Pete." That's because Julie and Steven have become enamored with the memory of Pete Maravich, one of the greatest basketball players of all time. And I'm responsible for this because I've told them about the Pistol since they were little. They've watched his instructional videos, read his biography, and viewed his life story. So they both are Pistol Pete "wannabes." That's okay with me. Children need good role models and examples. And Maravich was a Christian. But I would be disappointed if my children didn't see Jesus Christ modeled in my life also and want to be like Him. That's why when Stevie tells me that Jesus is his best friend, I'm a happy dad. As parents, we must tell our children about Jesus and be role models who live for Christ. That was the case with Paul, who counted Timothy as his son in the Spirit (1Ti 1:18), and with John, who rejoiced over those whom he called his children (3Jn. 4). Like a kindness or beautiful prayer. The greatest gift a parent can give is a worthy example. "At four, I was too young to have my own horse, and I'm not sure a horse fit for a four-year-old could have kept up with my father and sisters. So when we went horseback riding, I sat behind my father on his big horse. With my tiny hands, I'd hang on to the back of his belt and away we'd go. I'd bounce up and down in the saddle, sliding this way and that, but as long as I had a strong hold on that belt, I knew I was safe." WE WON'T BE TRAPPED BY SATAN'S LIES. Pastor H. A. Ironside had a man in his church who always tried to run the board meetings. If Ironside agreed with him, all went well. But when he disagreed, he would receive a harsh letter from the man, who sarcastically addressed him as “Dear Diotrephes.” Actually, the board member deserved the title, not Ironside, who was known for his graciousness. In John’s third letter we read about Diotrephes, who wanted to be a boss in the early church. Overly ambitious and domineering, he opposed the apostle John and set himself up as a dictator over those in his spiritual care. Anyone who took exception to him was dismissed from the congregation. A lust for power springs from pride and selfishness. In contrast, Jesus served in humility and obedience to His Father (Phil. 2:8). He must be our pattern. 3 John 4 - Spurgeon - “I have no greater joy than this: to hear that my children are walking in truth.” It is grievous to see how some professing Christian parents are satisfied as long as their children display cleverness in learning or sharpness in business, although they show no signs of a renewed nature. If they pass their exams with credit and promise to be well fitted for the world’s battle, their parents forget that a superior is calling, involving a higher crown, for which the child will need to be fitted by divine grace and armed with the whole armor of God. If our children lose the crown of life, it will be but a small consolation that they have won the laurels of literature or art. Many who ought to know better think themselves superlatively blessed if their children become rich, marry well, strike out into profitable enterprises, or attain eminence in their profession. These parents will go to bed rejoicing and wake satisfied—though their boys are on the road to hell—if they are also making money. They have no greater joy than that their children are having their portion in this life and laying up treasure where rust corrupts it. Though neither their sons nor their daughters show any signs of the new birth, give no evidence of being rich toward God, manifest no traces of electing love, redeeming grace, or the regenerating power of the Holy Spirit, yet the parents are content with their condition. I hope no parent will allow their children to grow up and leave their roof without knowing the doctrines of the gospel, the life of Christ, and the great precepts of Scripture—without having as clear an understanding as possible of the great principles and plan of salvation. It should be the holy ambition of every parent that his entire family should be renewed by the Holy Spirit. Happy as a marriage day is that day when a parent sees his child surrendered to the people of God, having first given his heart to Christ. The joy of the text is that the children “walk in the truth”—the actual demonstration of the power of the gospel in their lives. This proves that the teaching was well received, the feeling was not mere excitement, and the profession was not a falsehood but was done in truth. Their motive. — “For the sake of the Name.” It is not needful to say whose Name. There is one Name above every name, in which whatever we do is to be done. To teach the meaning hidden in that Name; to unfold its sweetness and power; to exert its spell over souls that had never felt its magnetism; to glorify it and make it honored and beloved — this was their one thought and aim. Oh that we were animated by the same gracious motive! Their delicacy. — They would take nothing of the Gentiles. It seemed to them incongruous to go for alms and maintenance to those who do not love their Lord. Besides, could not He maintain his own servants? They certainly would not have sanctioned the means that modern Christians adopt of getting money from the ungodly. For His name’s sake they went forth. 3 John 7. Our Lord has told us how love to Him is to manifest itself. “Lovest thou Me?” “Feed My sheep”—identify yourself with My interests in other people, not, identify Me with your interests in other people. 1 Corinthians 13:4-8 gives the character of this love, it is the love of God expressing itself. The test of my love for Jesus is the practical one, all the rest is sentimental jargon. Loyalty to Jesus Christ is the supernatural work of Redemption wrought in me by the Holy Ghost Who sheds abroad the love of God in my heart, and that love works efficaciously through me in contact with everyone I meet. I remain loyal to His name although every commonsense fact gives the lie to Him, and declares that He has no more power than a morning mist. In the New Testament family album three men whose names begin with the same letter stand out as typical of three kinds of Christians today. The Scripture account of them all is very brief, but a little window lets in much light and from the meager record we immediately recognize that their kind has not yet disappeared from the earth. 1. There was Demas, who forsook Paul, having loved this present world (2 Tim. 4:10). Doubtless he had started out in dead earnest, maybe with plenty of fire, but the pull of the old life and the charm of the world were too much for him. 2. Then, there was Diotrephes, who loved the preeminence (3 John 9)… His sort is still with us in the minister who bosses instead of shepherds his flock; in ecclesiastical overlords who reject all visiting brethren who do not measure up to their private yardstick; in any and all who want to rule instead of serve. 3. How refreshing it is to move from these two troublesome souls to Demetrius, who loved the truth (3 John 12). Whether or not he was the Ephesian silversmith, now converted, he had good report of all and of the truth and of John; and his sort is altogether too rare today. He was no celebrity, but we could profitably exchange some of our striking personalities for more of his kind. What would the church do today without his quiet, faithful, steadying testimony?